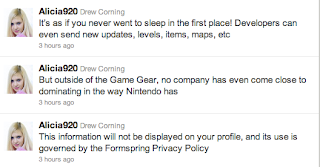 I'm not a very popular online personality. I mean, only 9 people follow me here, only about 120 on twitter, and I'm pretty sure most of the the 600 friends on facebook are really more acquaintances than anything. So I was pretty sure the sudden 144 followers on twitter had to be spam. I decided to check each one out, because you never know if you might have just had a super awesome rise in popularity or if it really was just spam. 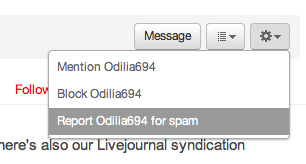 I also decided to do my civic duty and report each one for spam. This task involved me opening each one and individually clicking "report as spam"
This idea turned out to be an awesome adventure in spam. I blocked a few of the spammers at first, because they didn't have those typical "click here" tweets. They seemed different and if they weren't spam, I just didn't want them to follow me. But then, I realized...all of these people had the same tweets! And Tisa515! You devil you! At this point, I was sure that what I was doing was helping. I mean, if anything I was helping twitter identify people who have stolen books from their local library. Who is Raguel046 talking to? but... wait, whats this about cookies? This one is my favorite. I'm through about 120 of them by now and each one has the same type of tweets. 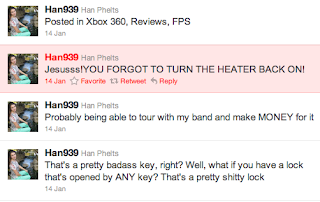 Except Han939. 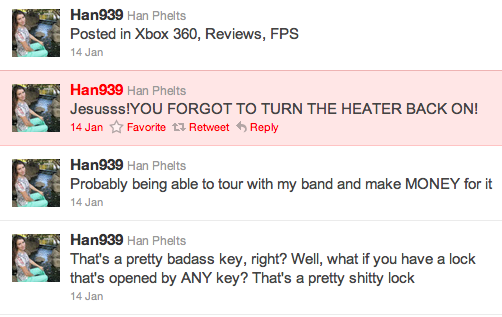 Han939 is mother effing CRAZY. After about 120 of them, it seems the spammer got tired of making up names. And after about 120 of them, it seems them spammer got tired of searching for unique photos. And then, after 144 of them, I realized that somehow this spammer is taking all of these tweets from articles, blogs, other tweets, etc. It took about an hour to get this done, but I think I filled up my internet kharma by reporting all of this spam. My followers went right back down to 120ish and I am back to being an unpopular internet persona. I do want to say that I really liked that one fictional moment when I had 264 followers. It was nice. Its not that I'm mad that Sally Field won the 1979 Oscar for Norma Rae. But is there any way we can give a retroactive Best Actress Oscar to Bette Midler in The Rose? This was her film debut, in 1979, in a movie based on Janis Joplin (it says "modeled after" on Wikipedia, but you pretty much know its about Janis). Bette Midler is "devastatingly brilliant", a quote I will take from my friend, in this role and all you want is a happy ending. But, like Janis Joplin, you don't get one. I went and searched the YouTubes for any sort of clip of that movie and all I really got was a bunch of songs by Bette Midler. In the end though, I think you should definitely just watch the whole movie because it is just so sad. Why would I want to watch such a sad movie, you ask? Because maybe all those comedy/action/fantasy movies aren't enough anymore. Thats why. This past holiday season I found myself taking another step into "growing up" by trying to make all the nice New Mexican dishes that my mom usually makes. These dishes mostly involve New Mexican Red Chile Sauce. Most people who read this blog know exactly what I am talking about, but for those select few that don't, Red Chile Sauce (and Green Chile) are staples of Mexican food. New Mexican food just has a bit of a twist. We smother all our food in chile. Our chile is made from New Mexican chile pods grown right in New Mexico. Most people like green or red, some like both, but I love red chile. I've only made chile once before and this time I took pictures of what I did, mainly because I got a new camera for christmas, but also because I'd like to remember what I did. Be aware that I don't have measurements like"teaspoons" or anything so you might have to make that stuff up as you go. Caution: When making your chile, make sure you do not touch your eyes. Oh the humanity if you do. 1.Take 20 dry chile pods and snap of the stems. Shake out the seeds in the trash. 2. Put pods in a pot and fill with hot tap water. Hold the top on the blender so it doesn't shoot up into your face and burn your skin off. 4. Once blended, pour the chile into a sieve and mush it down into a pot. This will get all the bits o' skin and rest of the seeds out and you will have a delicious sauce left! Once you got this... You are done. 6. Take the pan and put a bit of oil in it and heat it up. Pour about 4 spoonfuls of flour in and heat it until its brown. Pour in chile and stir. Congratulations you have made New Mexican Red Chile Sauce! I love to create things and I love to share it with you. I've never been to Europe, but I'd like to go.